Amazon Prime is Amazon Crime with Lone Star Overnight Ground Shipping | Views...News...and Reviews! Amazon Prime advertised free Prime 1 day shipping in my location on December 23, 2016. It was “guaranteed” to be delivered by 8pm December 24th. Not estimated. Guaranteed. It’s Jeff Bezos’ company and I figure his company is as good as his word, so I ordered an item on December 23rd 2016 believing it would arrive by 8pm December 24th. It was a Christmas item that needed assembly so it would be assembled by me overnight and ready by Christmas morning. It never arrived and by the carrier’s website postings, it never stood a chance at the time the order was posted. Amazon’s ad was a fraud. Amazon guaranteed delivery by Christmas Eve yet used a shipper that does not deliver on Christmas Eve, Christmas Day, or December 26th. Is Amazon dumber than a fifth grader or did Lone Star commit fraud on Amazon to get the contract? On December 24th by 10pm there was NOTHING at my door step. Amazon was still showing delivery as December 24th. I sent an email to Amazon but got no immediate reply. The carrier showed as ‘Lone Star’. Lone Star Overnight was showing as the carrier. I then checked the shipping carrier’s website. It turns out the shipping carrier, Lone Star Overnight Ground Shipping doesn’t even ship on 12/24, 12/25, and 12/26 so the soonest it would arrive is well after relatives are home, 12/27. Did Lone Star commit contractual fraud on Amazon or is Amazon not smarter than a fifth grader?! Christmas morning arrived and there were no gifts, was it Amazon or Lone Star? Amazon contracted with Lone Star but Lone Star never told Amazon it doesn’t deliver on those dates. Amazon may have contracted for those dates, so that would mean Lone Star may have committed contractual fraud by not fulfilling the terms of their contract with Amazon. Amazon contracted with Lone Star but Lone Star told Amazon it doesn’t deliver on those dates. Amazon advertised the 1 day guaranteed shipping anyway and thus Amazon committed fraud. Amazon contracted with Lone Star but doesn’t know how to review contracts and failed to realize that Lone Star doesn’t ship on those dates, but advertised 1 day shipping guarantees anyway, which makes Amazon dumber than a fifth grader. This would mean that Jeff Bezos doesn’t run a company that is smarter than a fifth grader. So did Amazon commit fraud by advertising what they knew they could not deliver, did Lone Star commit fraud by taking the Amazon contract but knowing they could not deliver, or was Lone Star up front but Amazon employees can’t even read a contract, making them dumber than a fifth grader? It is the day after Christmas. We have contacted Lone Star but have not heard back. Amazon refunded the package, is allowing us not to be hassled with the return (it’s 41 lbs!) and sent us a $25 credit but that doesn’t change the fact that fraud may have been committed either by Lone Star or Amazon. It is worth noting that Lone Star has some pretty bad reviews from Amazon Customers but Amazon retains Lone Star. Lone Star Overnight on Yelp – Mostly 1 star. Thank you for reaching out to LSO regarding your package. We do apologize for any inconvenience this may have caused you but your package was never tendered to LSOfor delivery from Amazon. You would have to contact Amazon and really see what happened with your package but as of today Tuesday 12/27/16 LSO has not received your package from Amazon. Please let us know if there is anything further we can do to assist. So essentially Amazon never tendered the package over – meaning that the email offer for 1 day shipping never had a chance of getting here by Christmas. And as of now, there is no package. We have requested from Amazon a promotional credit for $66.29 to re-order the item with normal prime shipping since it will be a few days before the refund processes. We would like to try to salvage Christmas. We are also considering filing with the Washington State Attorney General for a truth-in-advertising claim against Amazon. This is a odd. Especially nice the package never had a chance of getting here either way. The Amazon system STILL shows estimated delivery as tonight, 12/27/2016 and the Lonestar system STILL shows it as pending. 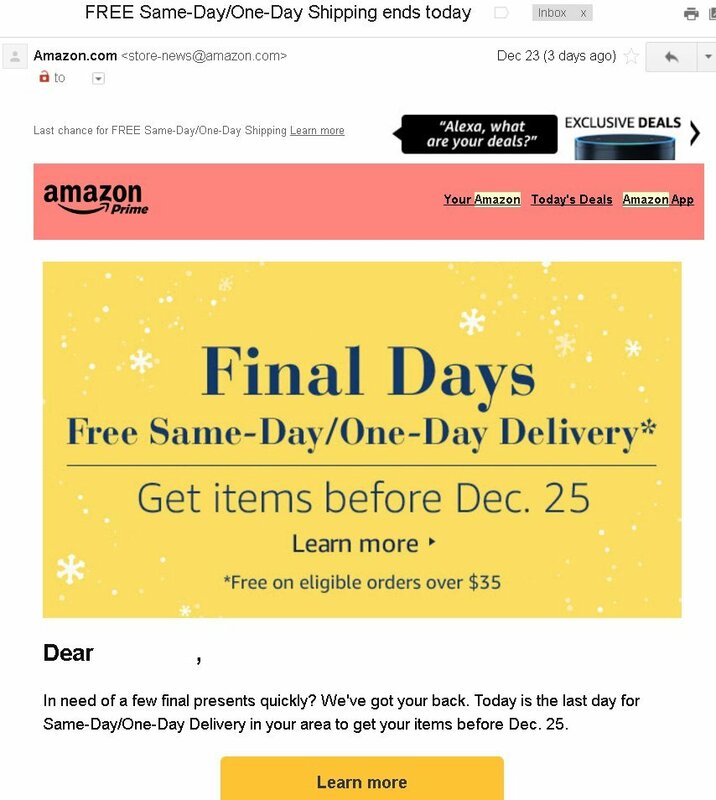 Though the individual consumer issue was concluded by a credit / refund, it still raises the question of Amazon advertising next-day-delivery using a carrier that does not deliver that day. How you can advertise something that you knowingly cannot deliver is beyond me.